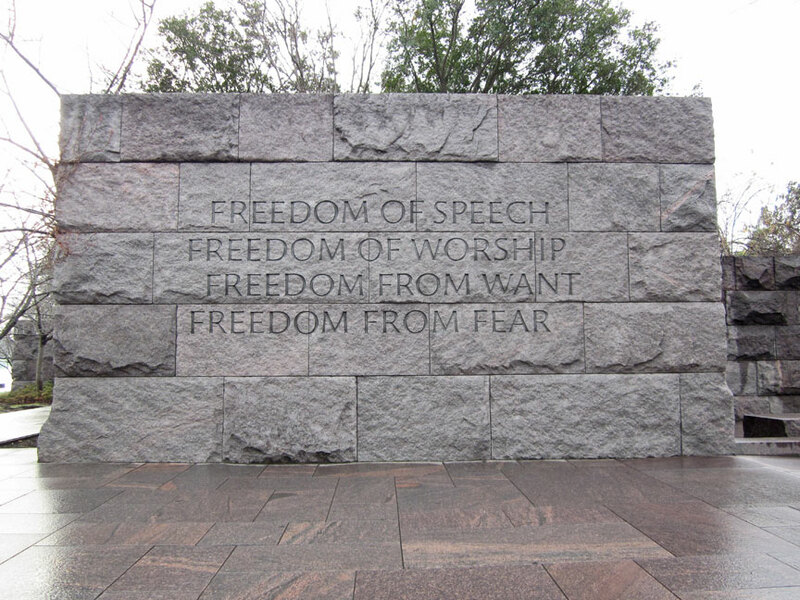 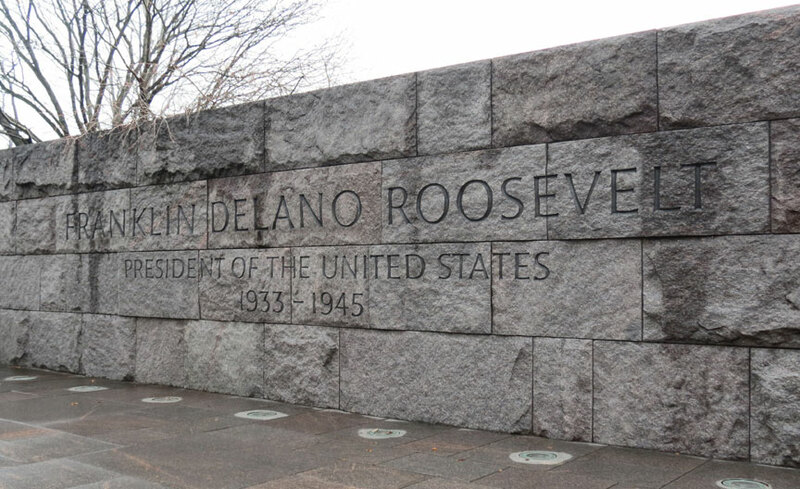 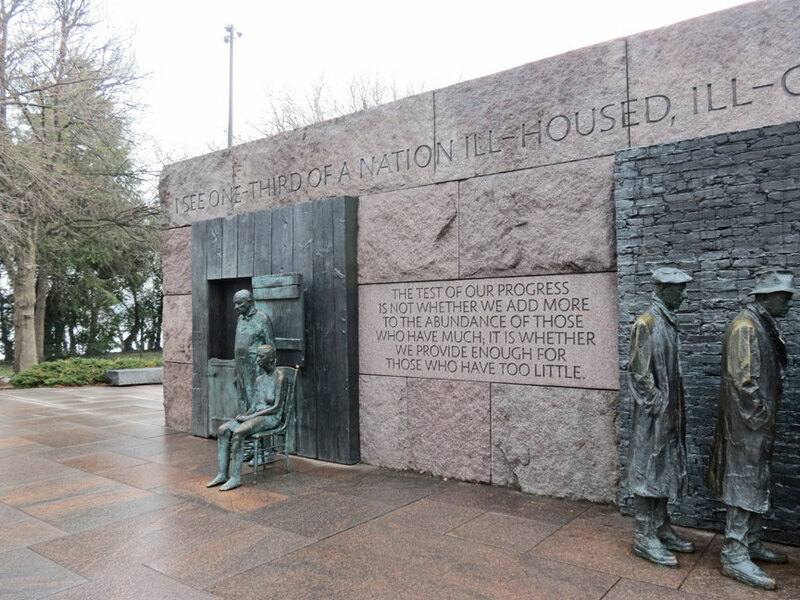 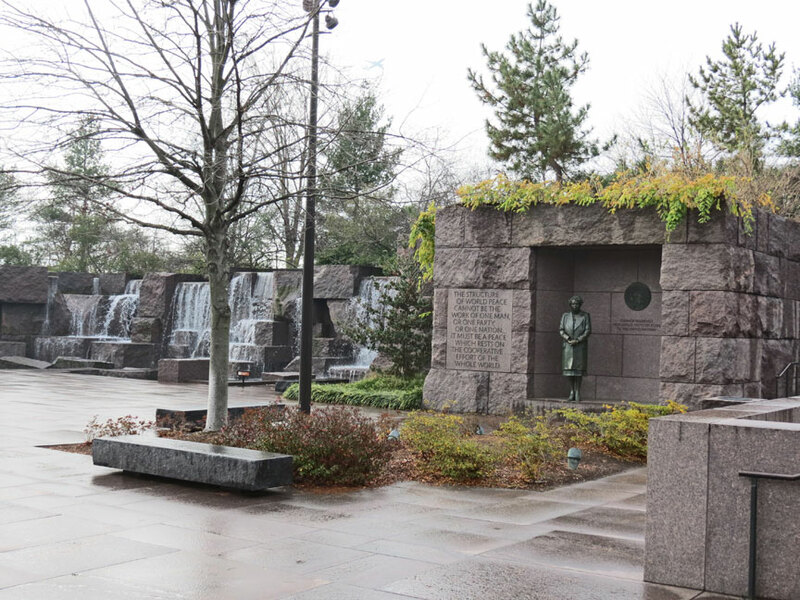 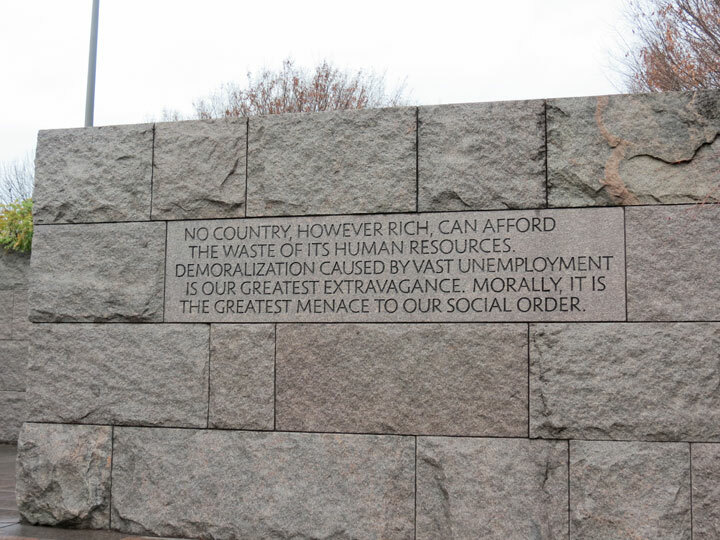 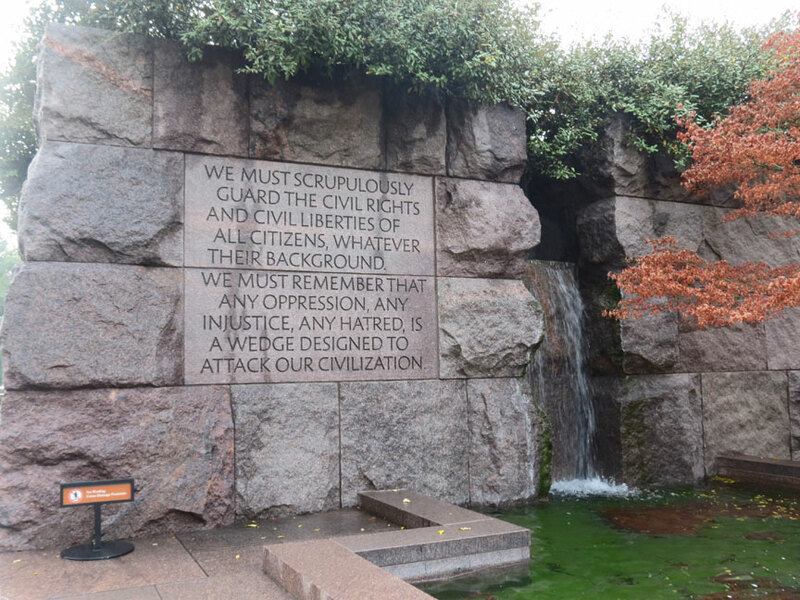 The Franklin Delano Roosevelt memorial is a presidential memorial dedicated to the memory of U.S. President Franklin Delano Roosevelt and to the era he represents. 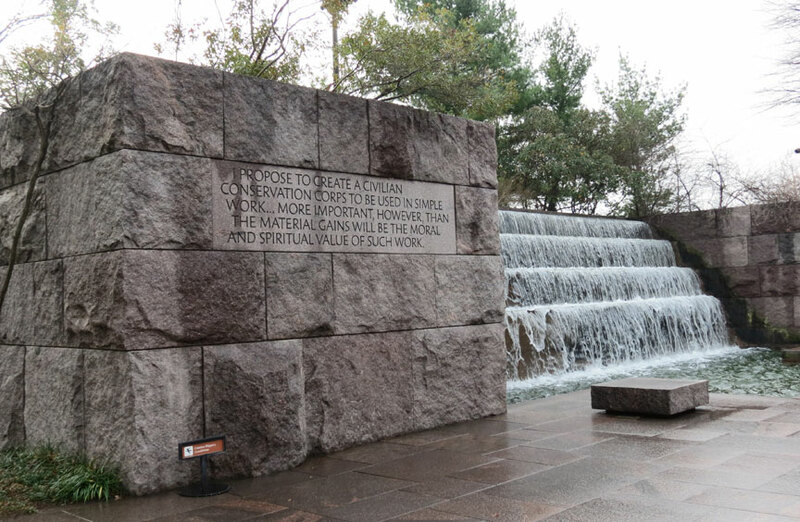 For the memorial's designer, landscape architect Lawrence Halprin, the memorial site represents the capstone of a distinguished career, partly because the landscape architect had fond memories of Roosevelt, and partly because of the sheer difficulty of the task. 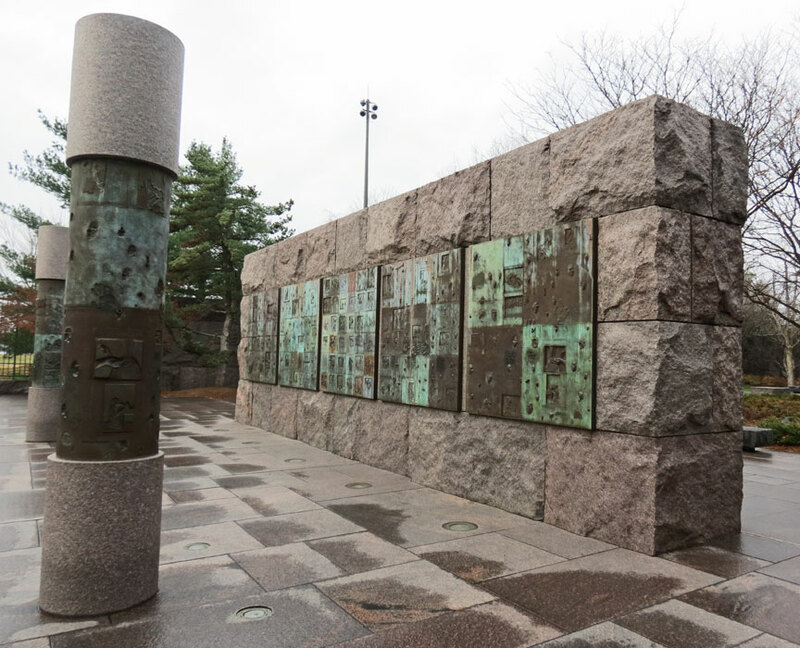 Dedicated on May 2, 1997 by President Bill Clinton, the monument, spread over 7.5 acres (3.0 ha), traces 12 years of the history of the United States through a sequence of four outdoor rooms, one for each of FDR's terms of office. 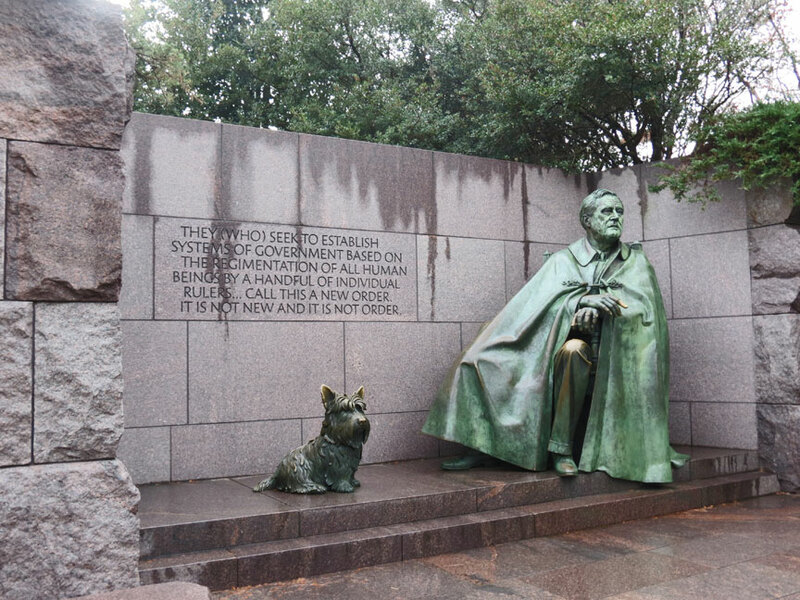 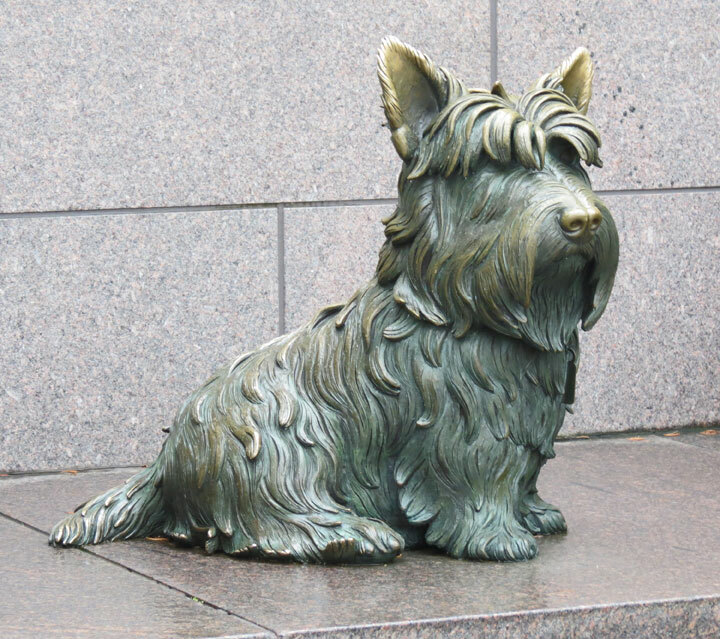 Sculptures inspired by photographs depict the 32nd president alongside his dog Fala. 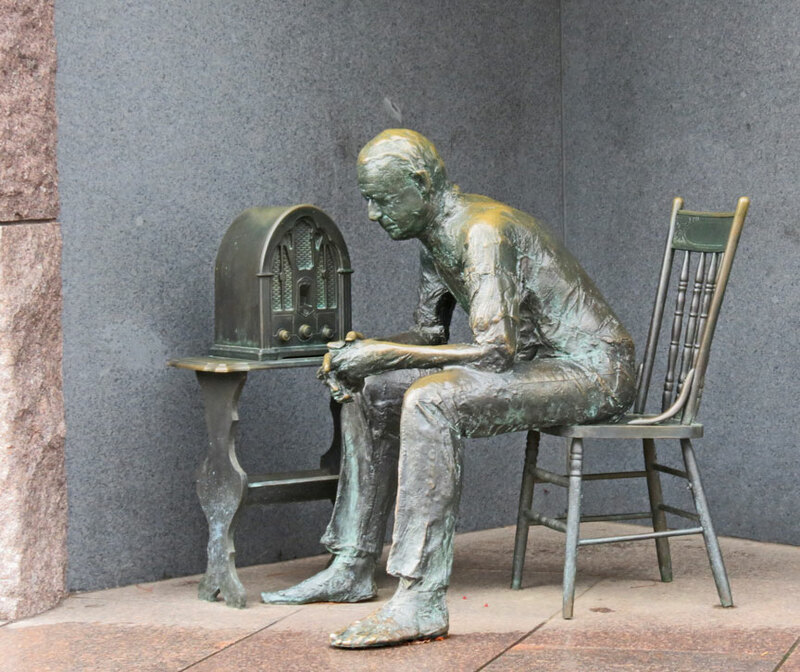 Other sculptures depict scenes from the Great Depression, such as listening to a fireside chat on the radio and waiting in a bread line, a bronze sculpture by George Segal. 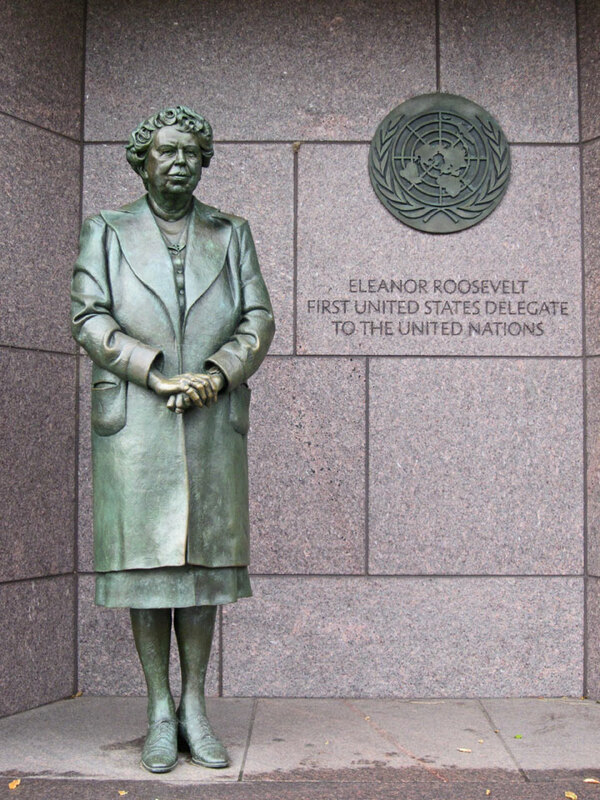 A bronze statue of First Lady Eleanor Roosevelt standing before the United Nations emblem honors her dedication to the UN. 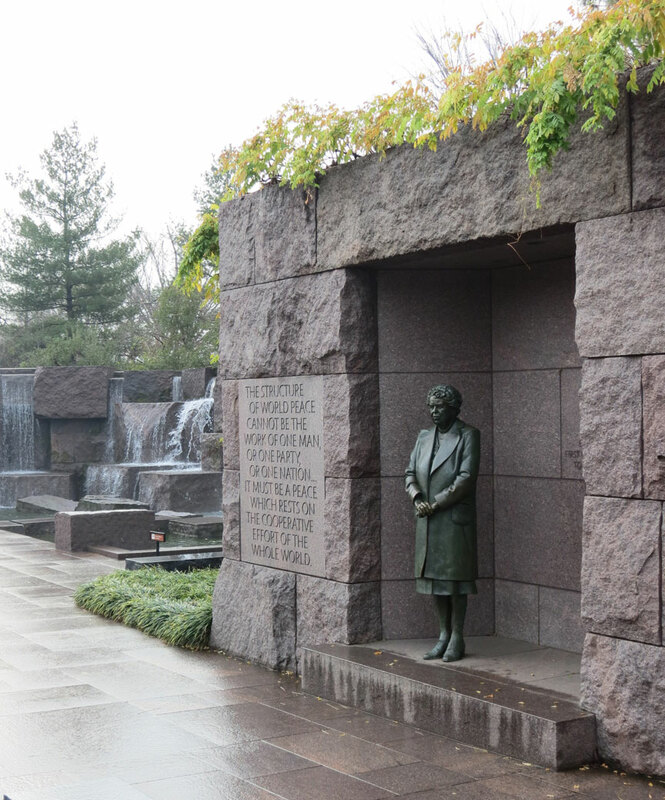 It is the only presidential memorial to depict a First Lady. 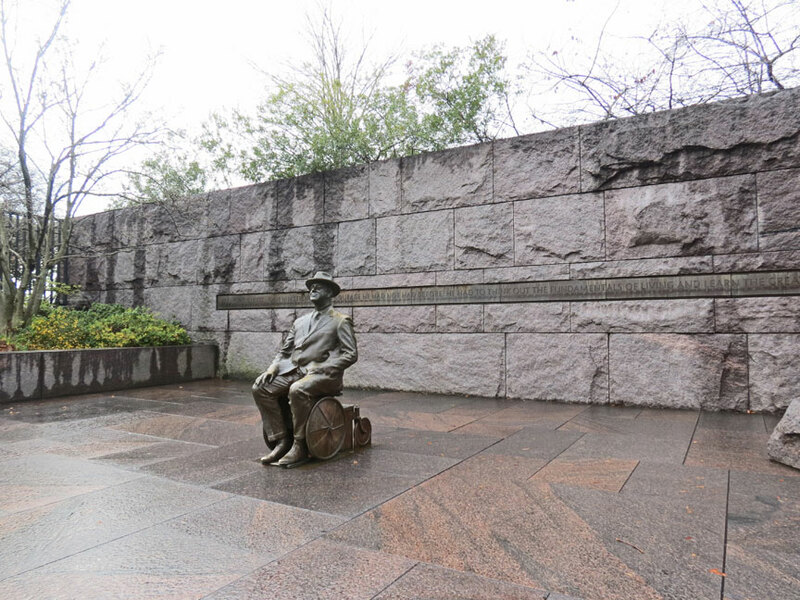 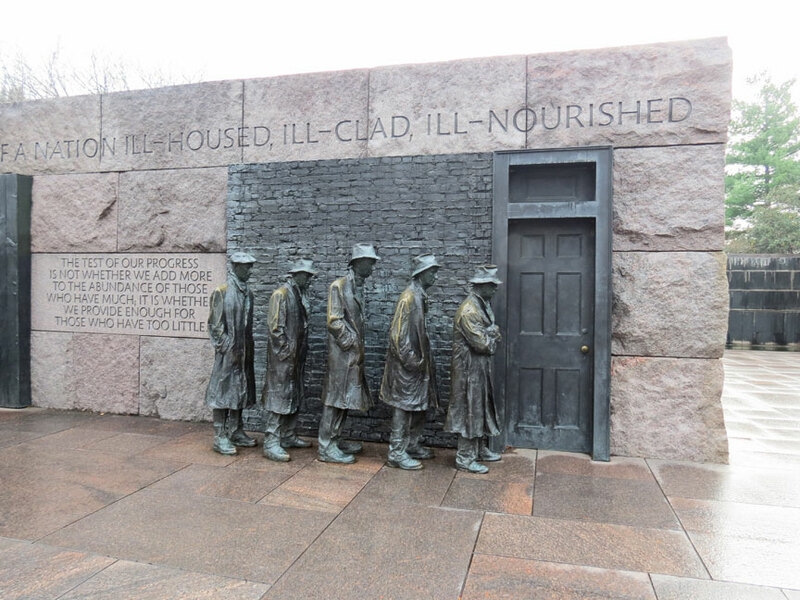 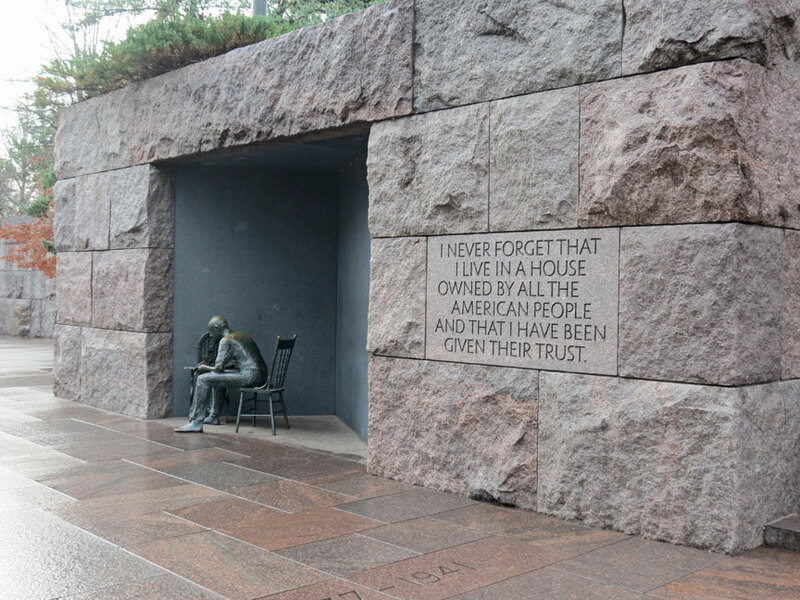 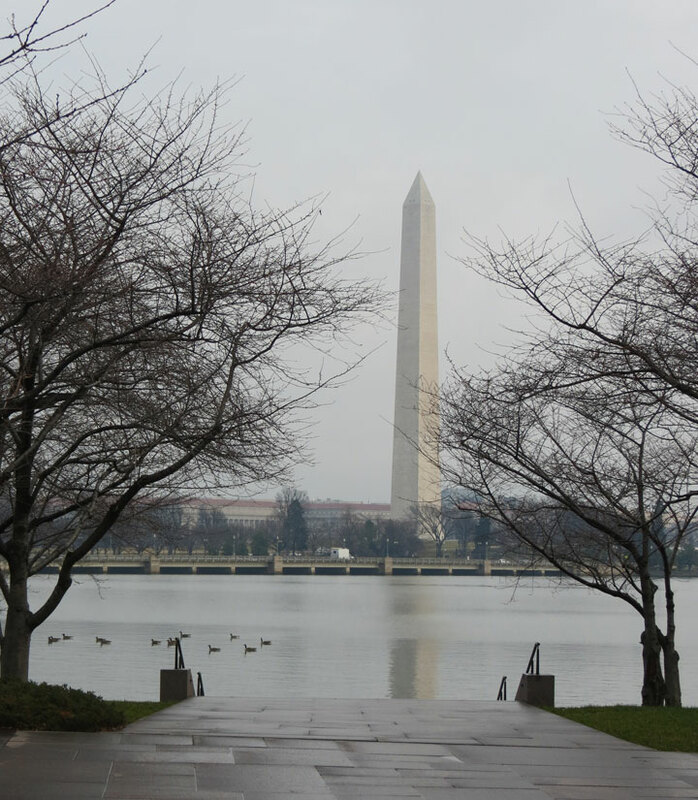 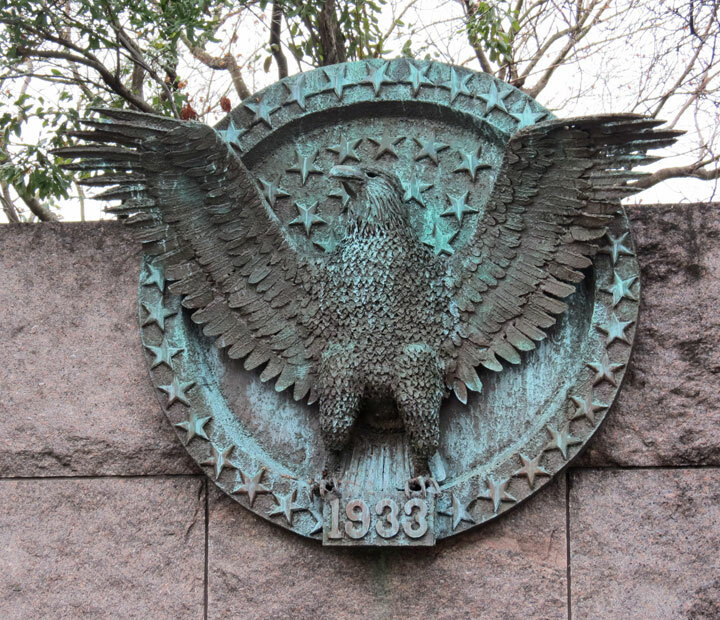 Considering Roosevelt's disability, the memorial's designers intended to create a memorial that would be accessible to those with various physical impairments. 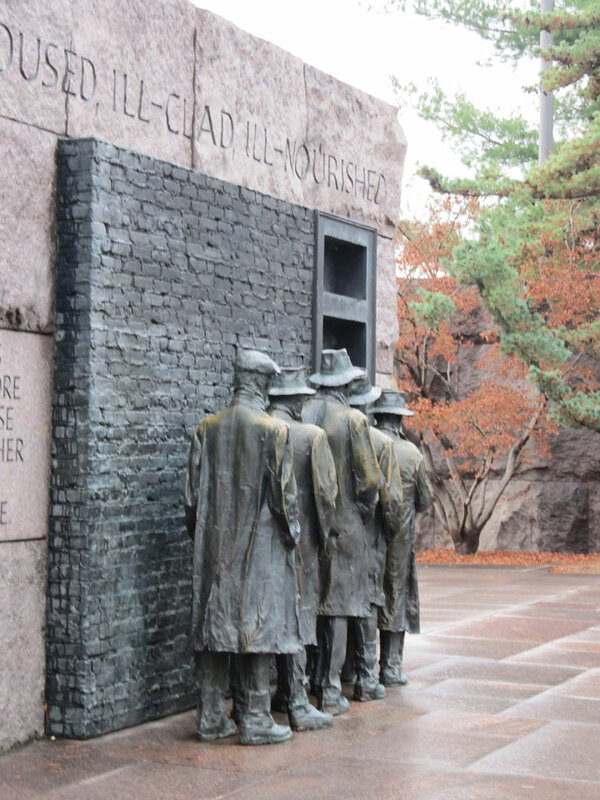 Among other features, the memorial includes an area with tactile reliefs with braille writing for people who are blind. 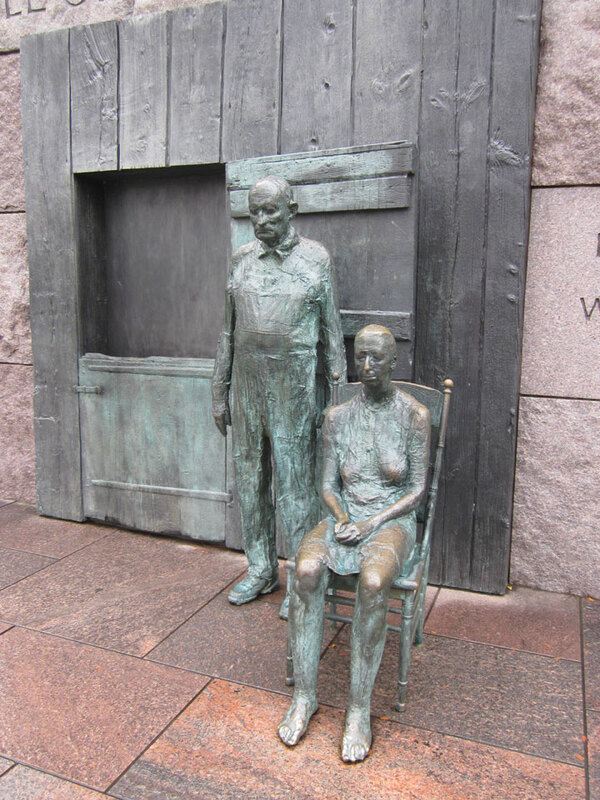 However, the memorial faced serious criticism from disabled activists. 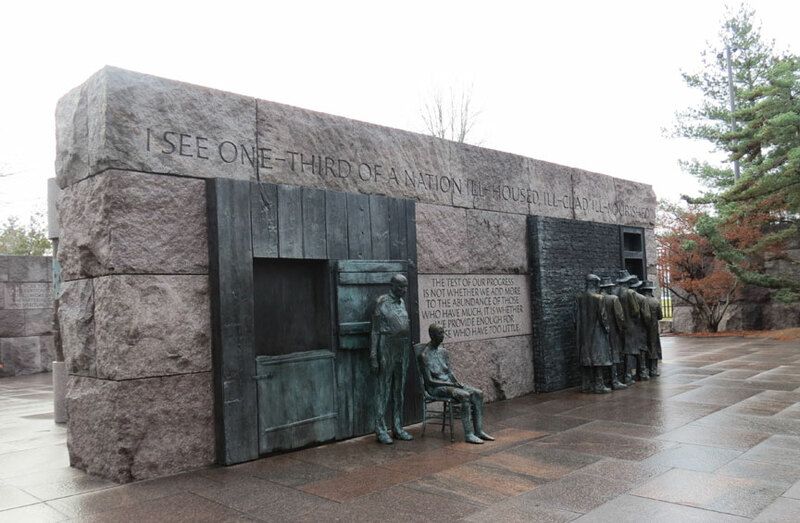 Vision-impaired visitors complained that the braille dots were improperly spaced and that some of the braille and reliefs were mounted eight feet off of the ground, placing it above the reach of most people. 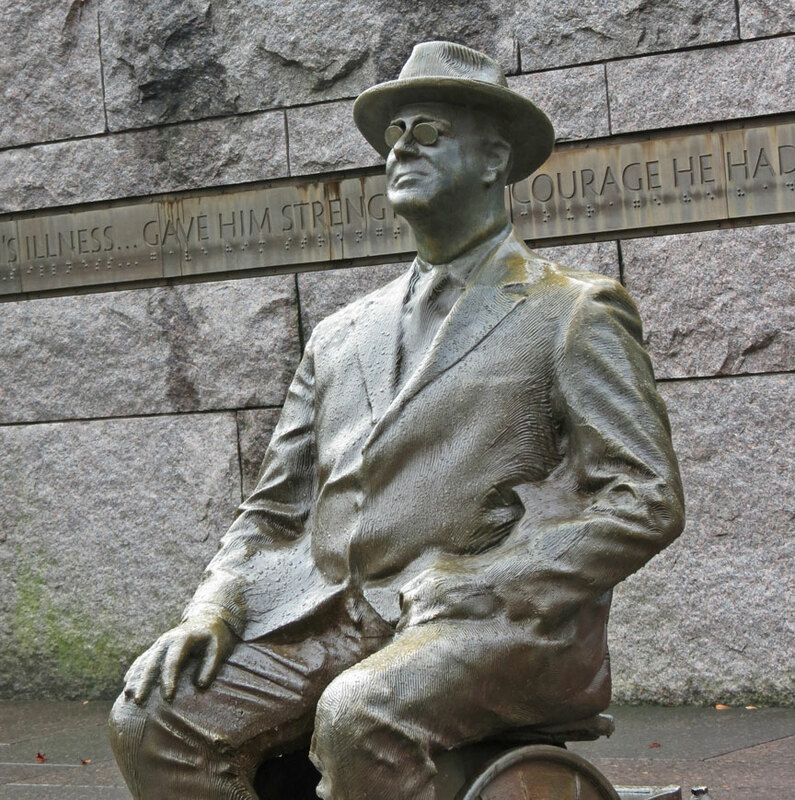 The statue of FDR also stirred controversy over the issue of his disability. 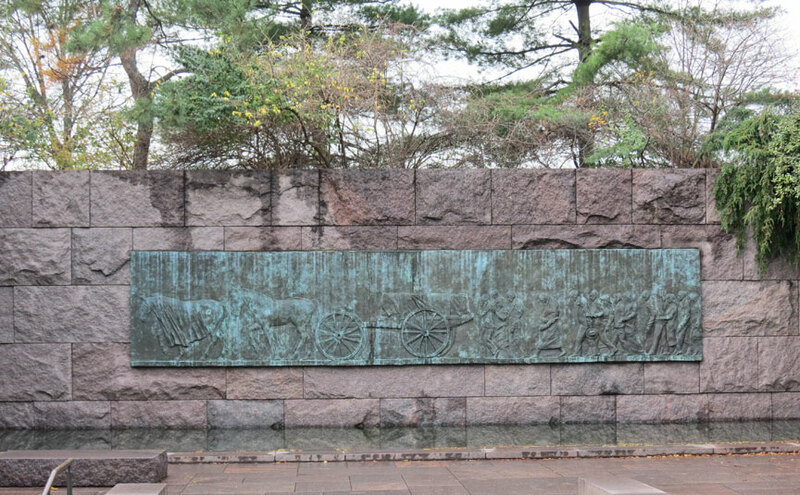 Designers decided against plans to have FDR shown in a wheelchair. 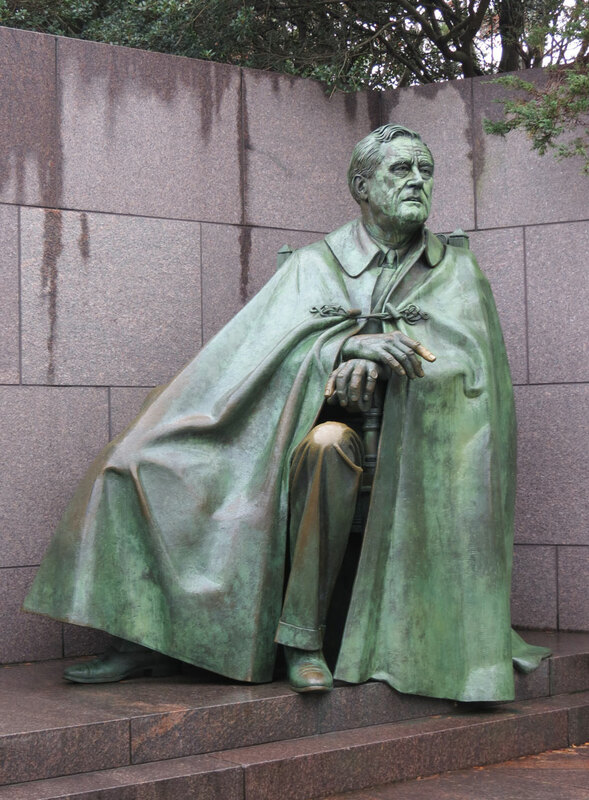 Instead, the statue depicts the president in a chair with a cloak obscuring the chair, showing him as he appeared to the public during his life. 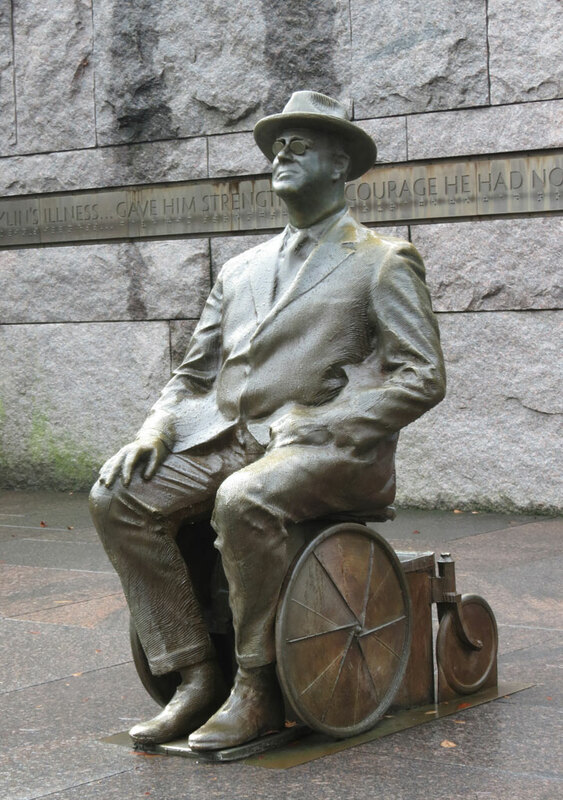 Roosevelt's reliance on a wheelchair was not publicized during his life, as there was a stigma of weakness and instability associated with any disability.] 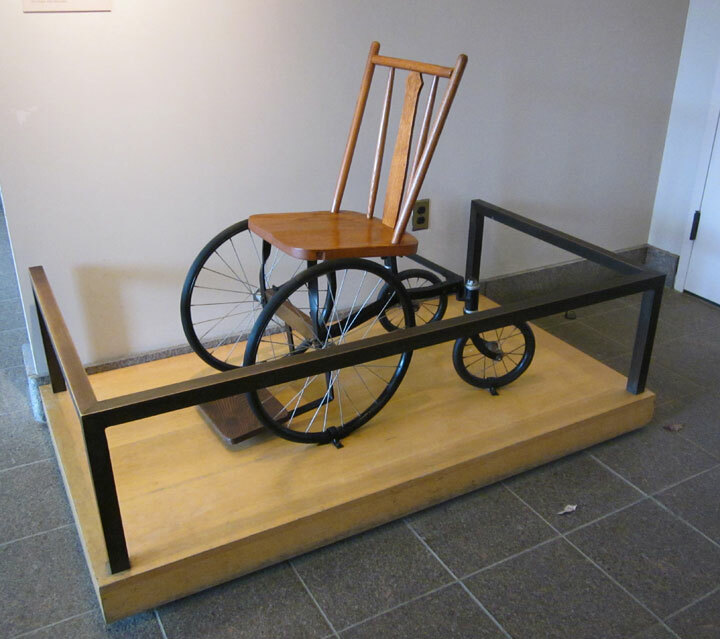 However, historians and some disability-rights advocates wanted his disability to be shown for historical accuracy and to tell the story of what they believed to be the source of his strength. 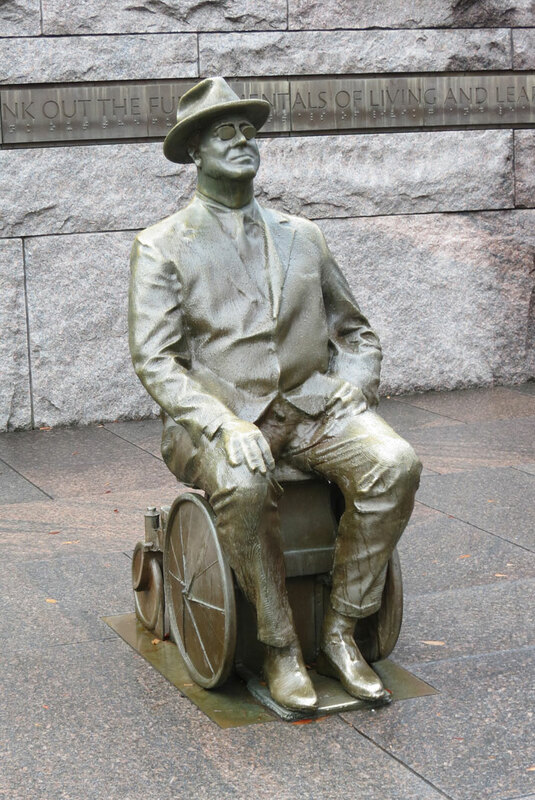 Other disability advocates, while not necessarily against showing him in a wheelchair, were wary of protests about the memorial that leaned toward making Roosevelt a hero because of his disability. 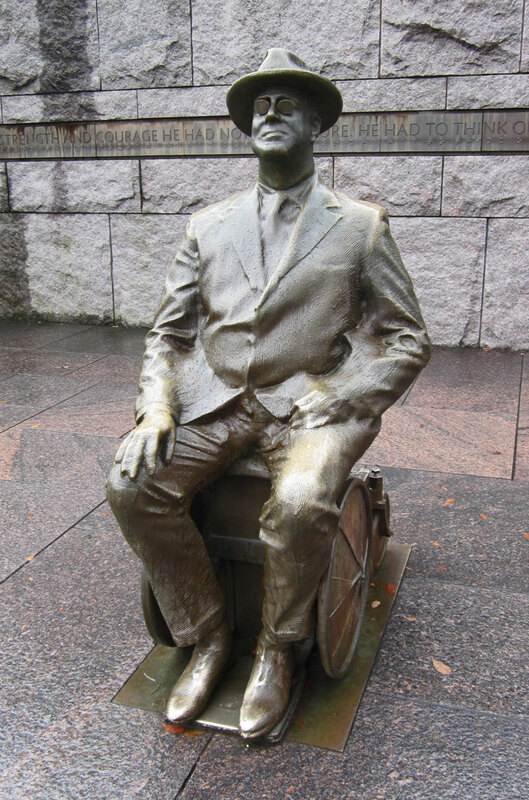 The National Organization on Disability, headed by the efforts of Alan Reich, raised US$1.65 million over two years to fund the addition of another statue that clearly showed the president in a wheelchair. 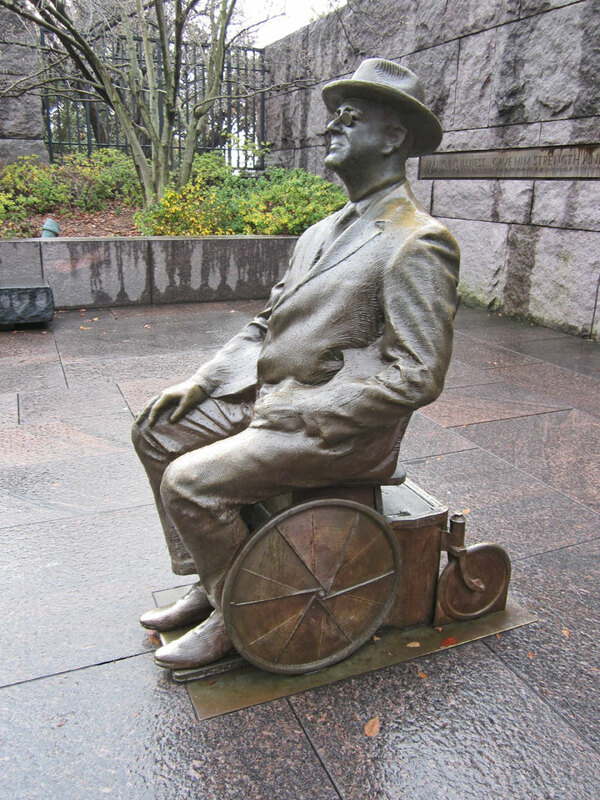 In January 2001, the additional statue was placed near the memorial entrance showing FDR seated in a wheelchair much like the one he actually used. 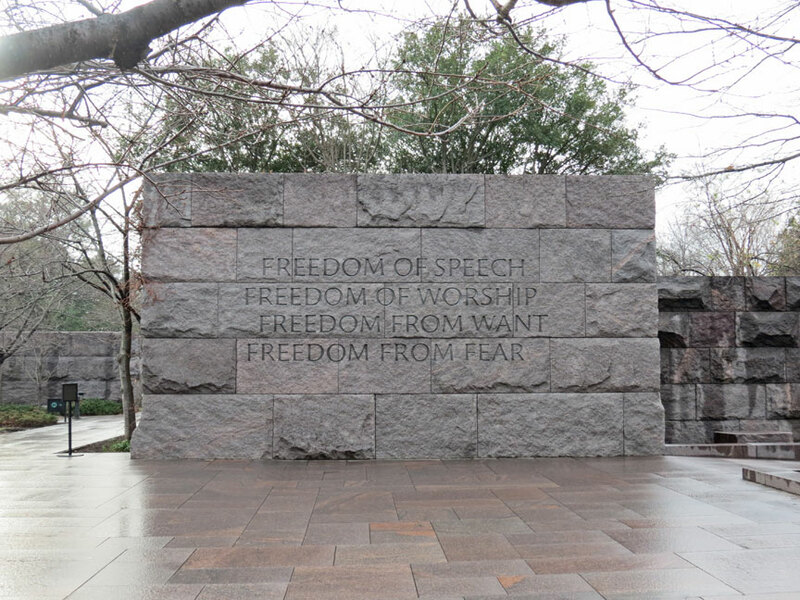 The memorial's designer construed the wheelchair controversy as evidence of success: "The most important thing about designing is to generate creativity in others, and to be inclusive – to include the needs and experiences of people interacting with the environment, and to let them be part of its creation.